There is some question whether Passeroidea includes Promeropidae (shown directly under Passerida), but the rest of the superfamily is clearly monophyletic (Barker et al. 2002, 2004; Ericson and Johansson 2003; Beresford et al. 2005). Nectariniidae (sunbirds) and Dicaeidae (flowerpeckers) are sisters (Barker et al. 2002, 2004; Ericson and Johansson 2003; Beresford et al. 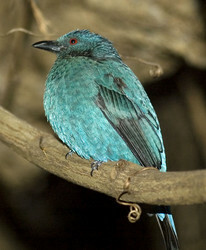 2005), and form a trichotomy with Irenidae (fairy bluebirds) and remaining passeroids (Barker et al. 2002, 2004; Beresford et al. 2005). Peucedramus (olive warbler), previously thought to be either a parulid or basal within 9-primaried oscines (Sibley and Monroe 1990) is instead sister to Prunellidae (accentors) (Ericson and Johansson 2003), and these are sister to the remaining passeroids (Barker et al. 2002, 2004; Ericson and Johansson 2003; Beresford et al. 2005). Passeridae (Old World sparrows) and Motacillidae (pipits and wagtails) are successive sister groups to the nine-primaried oscines (Barker et al. 2002, 2004; Ericson and Johansson 2003). Though this is weakly supported in each analysis, agreement between analyses and a three-codon insertion in the c-myc sequences (Ericson et al. 2000) are conclusive. Page: Tree of Life Passeroidea. Authored by David P. Mindell, Joseph W. Brown, and John Harshman. The TEXT of this page is licensed under the Creative Commons Attribution-NonCommercial License - Version 3.0. Note that images and other media featured on this page are each governed by their own license, and they may or may not be available for reuse. Click on an image or a media link to access the media data window, which provides the relevant licensing information. For the general terms and conditions of ToL material reuse and redistribution, please see the Tree of Life Copyright Policies.